Orbitsound launches SB60 airSOUND Base one-box TV solution | What Hi-Fi? Following on the launch of its M series soundbars, British audio technology brand Orbitsound has launched a new one-box TV solution, the SB60 airSOUND Base. Powered by the company's patented airSOUND technology, Orbitsound claims that the SB60 delivers rich quality sound at either high or low volumes, thereby enhancing dialogue, music, action and sound from everyday programming. Measured at a compact 60 x 30 x 8cm (width x depth x height), the SB60 is suited to 32 - 42in screens and can be used for TVs ranging up to 55in. And yes, your TV sits on top of the unit, which sets it apart from most soundbars on the market. Customisation is limited to removing the front grille and replacing it with a silver one (included in the package), if you so desire. The box features an optical connection for a link-up to your TV, with a 3.5mm jack input able to accomodate other devices. 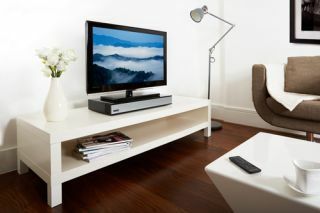 Available in John Lewis stores for £299, the SB60 airSOUND Base is available to purchase now.